Wow, how can it possibly be the last day of March already? I am more than ready for April, since we've had such a long and hard winter, but the month just went by very quickly. This past weekend was our only 48 hours alone together as a family until summer, so we drove about two hours away, to a St. Michael's, a lovely town on Maryland's Eastern Shore, and stayed at a beautiful inn out on a point surrounded by water. Unfortunately, it was dark, cold, windy, and pouring rain all weekend....AND my youngest son had bronchitis and a sinus infection and felt awful on Saturday! Not quite the getaway we'd pictured, but we still had a nice weekend and spent some time together as a family - we had some delicious meals, watched a movie in our room, and played cards (with lots of laughs!). I finished Gap Creek by Robert Morgan for my online family book group. It's a bit depressing at times, but overall, I enjoyed this novel about a hard life on an isolated farm in the Carolina mountains at the turn of the century. Next, I started another book group selection, The Unbearable Lightness of Being by Milan Kundera, a modern classic novel that was made into a popular 1988 movie. 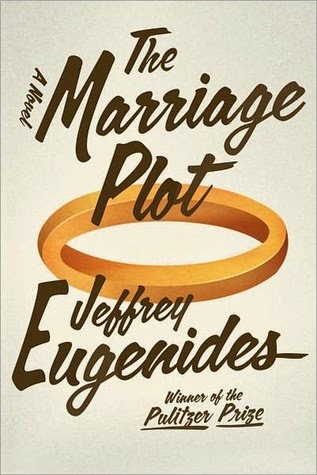 It's an unusual novel - very philosophical so far, about life and love. I have also been (slowly) making my way through another nonfiction book, Time Management from the Inside Out: The Foolproof System for Taking Control of Your Schedule -and Your Life by Julie Morganstern. Yes, I am still on a quest to get better at time management! I started a new audio book, The Carpet People by Terry Pratchett. Its history is interesting - the famous author (who has now written over 40 books) wrote this novel when he was only 17 years old! He revised it recently so that it could be re-released. My husband, Ken, finished Unsouled by Neal Schusterman, the book that was supposed to be the final one in the Unwind trilogy, but is now book 3 of 4. Apparently, Schusterman just can't let go of this story - and neither can his fans. My son and I can't wait to read this one. Ken is now traveling for the week and reading Brilliance, a suspense novel, by Marcus Sakey on his Kindle. Jamie, 19, has been on a reading streak lately! He is now on spring break for a week and has been reading like crazy. He told us he downloaded 26 free books to his Kindle last week! He already read two of them last week: The Last King's Amulet by Chris Northern (book one in The Price of Freedom series) and The Choosing by Jeremy Laszlo, book one of The Blood and Brotherhood Saga (Jamie has figured out that publishers often offer the first book in a series free as e-books!). He said both books were good. Now, he's gone back to an old favorite series, Beyonders by Brandon Mull. Book three was just released, so he is re-reading book two, Seeds of Rebellion, before moving onto the new book. At the beginning of January, I picked up two time management books at the library that I had heard good things about. One of those was 168 Hours: You Have More Time Than You Think by Laura Vanderkam. Ironically, it took me two months to finish reading the book, so apparently, I really needed it! That’s no reflection on the book, only my inability to read two books at once. I enjoyed the book and learned some useful tips on making better use of my time. Vanderkam’s main premise is that everyone has 168 hours in each week, and that the current belief that everyone is too busy and no one has any free time is a myth. She says that we all have plenty of time…if we use it wisely and according to our own priorities. She advocates starting with an analysis of how you currently spend your time by keeping a detailed time log for a week or two. I really liked this idea and downloaded the time log forms from her website. She then details how to analyze that data, looking for wasted time or excessive time spent on trivial things. She also suggests identifying your core competencies, those things that only you can do and that support your highest priorities. She next discusses goals and suggests starting with a brainstorming session to make your own list of 100 Goals/Dreams, just a free association kind of list of everything – big and little – you would like to do with your life. From that long list of goals, she says to take a few and develop smaller steps that need to be taken to move closer to the goals. This is something I started doing several years ago that has worked very well for me. I used to teach and consult with companies on how to reach their goals, and I taught them to break each goal down into specific objectives and then break those into individual steps to take. I realized that the same things I had taught to corporations would work for my own personal goals. I also made sure that all of my smaller objectives were measurable, and I find that that helps me to stay on track. 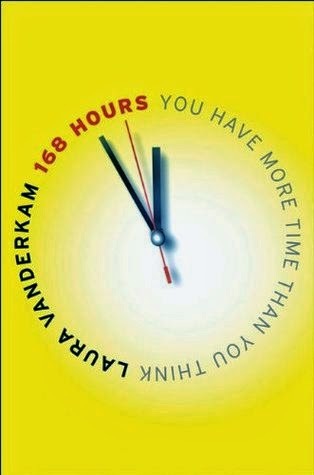 In 168 Hours, Vanderkam addresses both work and home time, with lots of suggestions for choosing priorities, finding work you love, meeting longer-term career goals, and having plenty of time in your life for the things that are really important to you, whether that’s family, work, exercise, volunteering, or some combination of those. Her tips range from making breakthroughs in your career to streamlining your wardrobe and serving simple meals and everything in between. Her main focus is on using the time you have more effectively, according to what’s important to you. Overall, I found the book useful. I did the time tracking and didn’t see anything earth-shattering, but it confirmed what I already suspected – mainly that much of my time was being sucked up by e-mail and responses to Facebook groups. Seeing that in black and white and reading Vanderkam’s advice helped me to come up with some strategies. Now I just need to make those into habits! Not everything in the book was applicable to me – I have a chronic illness, so I actually DO have less time than most people because I have to spend so much time sleeping and resting. But, I can apply her concepts within the time that I do have, and I liked her focus on defining what is important to you. Besides its usefulness, 168 Hours was interesting and well written, backed up by fascinating research, interviews, and lots of inspiring examples. So glad it is Monday - the weekend really wiped me out! Pretty sad when you need to recover from your weekend, huh? And not because I had a wild fun time - just because I did too much around the house, with cooking, dishes, laundry, etc. I really need to fix that and add a little fun into my Sundays! I finally finished The Amazing Adventures of Kavalier and Clay by Michael Chabon and loved every one of its 600+ pages! The characters and the time and place really pulled me in, and I was sad to say good-bye to Joe Kavalier and Sam Clay. Next, while I was away, I squeezed in a quick middle-grade novel, The Last Present by Wendy Mass. It turned out to be the last book in a 4-book series, and I only read the first one. 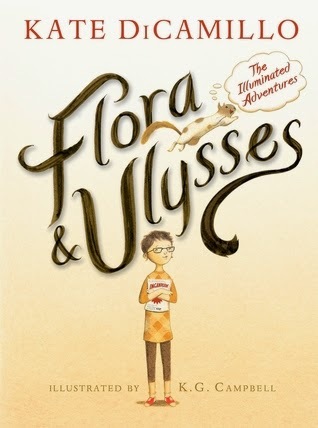 So, I obviously missed some of the references to earlier events, but I knew enough to enjoy the book - Mass is an excellent writer for middle-grade readers, and it's a time travel story (my favorite kind!). I recently started Gap Creek by Robert Morgan, the next selection for my online family book group. It's set in the rural Appalachians around the turn of the century, about a young girl who gets married and struggles to set up her own household in an isolated place. On the way home from the beach, I finished listening to Allegiant by Veronica Roth, the final book in the Divergent trilogy. I reviewed it (and the second book, Insurgent) when I got home. The third book was my favorite - now I have to go see the new movie! My husband, Ken, is reading Unsouled, the third book in the teen/YA Unwind series by Neal Schusterman, which he, our college son, and I all love. He's enjoying it so far - I can't wait to read it next! Jamie, 19, finished the Medieval fantasy series he was reading, The Staff and the Sword, by Patrick W. Carr. He finished reading book two, The Hero's Lot, and book 3, A Draw of Kings. Craig, 15, is reading MacBeth by Shakespeare for his Brit Lit class and said he did really well on last week's quiz! 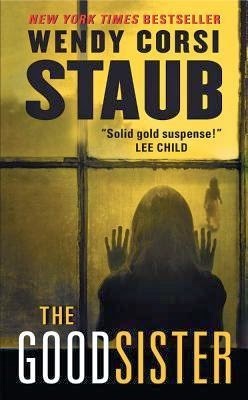 Review of The Good Sister by Wendy Corsi Staub, a thriller I listened to on audio. 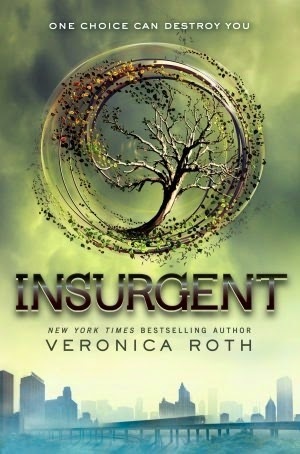 Review of Insurgent and Allegiant by Veronica Roth, also listened to on audio. Saturday Snapshot, with photos of my (cold) beach visit last week. As I explained last month, we recently started eating a Paleo diet for health reasons. It is going well so far - my son and I are both feeling better, and my husband (who has no health problems!) has more energy and drive than he's had in decades. I am still learning and trying to understand more about why this type of diet is good for us. Most important to me is that we don't sacrifice flavor or feel deprived. I have been mostly using regular recipes so far and making minor adjustments where needed to fit the Paleo diet. I was away on a mini retreat by myself for a couple of days this week, but we enjoyed some tasty dinners when I returned. As I've mentioned before, many of our meals now fit into a meat or fish plus two veggie sides model - this is really not all that different from a traditional dinner of meat or fish with one veggie and a starch. 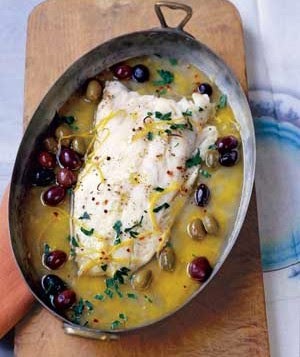 So, one night, I made Roasted Pacific Cod with Lemons and Olives, a recipe I cut out of Real Simple magazine a while back. We had roasted asparagus and steamed broccoli with it. Very tasty! We had a busy afternoon on Friday, with an appointment at 4 pm, so I needed a good crockpot recipe. I turned to my favorite crockpot cookbook, Cooking Light Slow Cooker Tonight, and looked for something that could easily be adjusted for Paleo. I settled on a dish we tried last year and loved, Chinese Pork Tenderloin with Garlic Sauced Noodles (sorry this one isn't online - you'll have to buy the cookbook to get it!) Yes, a noodle dish without the noodles might sound a bit strange, but the flavors in this meal are vibrant and full, so I knew it could stand on its own without the pasta. I added extra veggies (as is my habit!) to give it more volume about an hour before it was finished - I doubled the carrots and added a head of napa cabbage, thinly sliced (the recipe calls for raw carrots but my son is allergic to those and can only eat them cooked). I did cook up a small serving of whole wheat spaghetti for my younger son (who has no dietary restrictions) and mixed his with the noodles, as directed, but my husband and I just ate ours as is, and it was delicious. Though the sauce and mix of pork and veggies in this dish is good, the real stars are the fresh ingredients added at the end - cilantro, lime juice, and chopped peanuts (or cashews or sunflower seeds for Paleo). Delicious! And tonight, with my college son home for his weekly Sunday dinner, we will have his favorite, Americana Pot Roast. The only adjustment I need to make for him is to leave out the potatoes - I am substituting some turnips instead. 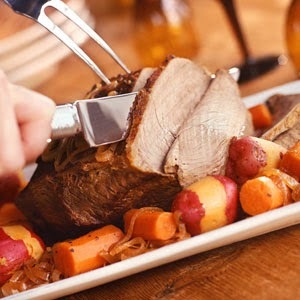 This is a really flavorful version of pot roast that we all love, a family favorite. I hope you have also enjoyed some fun cooking and delicious foods this week! This week, I took a little break and drove down to the beach for a mini getaway/writing retreat for myself at a friend's condo. It was quiet and peaceful, with no responsibilities or obligations to distract me! I did lots of reading and some much-neglected writing and also took some short walks on the beach, in spite of lingering winter weather! Cold temps, dark skies, and lingering snow kept the boardwalk pretty empty! I still love the ocean, even with those dark skies - the smell, the sound, and the sight. The weather didn't bother the locals! Hard to believe the next day was the first day of spring! On my last day, the sun came out! Hope you are having a wonderful weekend and enjoying the start of spring! I rarely read thrillers anymore. I still enjoy them, but I used to read mystery/suspense novels almost exclusively, so I guess I kind of overdosed on them! So, when I recently listened to The Good Sister by Wendy Corsi Staub on audio, it was definitely something different from what I usually read now, but I enjoyed it. I remembered why I used to enjoy suspense novels so much, as I had trouble setting my iPod down! The first chapters focus on a man who has returned to his childhood home in Buffalo, NY, to sell the house after his mother dies. It is obvious right from the first paragraph that some strange things went on in that house and that there was some sort of abuse present in his family, and by the end of the first chapter, the reader also knows that this man is a killer. The story than switches to the point of view of Carley, a teen girl attending the same Catholic high school, Sacred Sisters, that her mother, Jen, attended in the same Buffalo neighborhood. Carley is being bullied by her classmates, but she keeps that a secret from her mother. Soon, Jen and Carley and the rest of the community are shook up as a series of mysterious deaths occur among the local teen girls. At first, I wondered where the suspense was in this novel, since you know right from the first chapter who the killer is. It turns out that this is one of those thrillers more concerned with why than with whodunit. It’s a convoluted plot, with many twists and turns. I did guess at some of the why midway through the book, but the author still had plenty of surprises in store for me – all the more surprising because I thought I had things all figured out! Like most thrillers, there is quite a bit of violence in this novel, as well as some very disturbing incidents. The story focuses heavily on social media’s role among today’s teens, with its ripped-from-the-headlines elements of online bullying and kids seeking online support from strangers whom they trust too quickly (again, no spoilers here that the author herself doesn’t reveal early on). It’s a scary story for parents of modern teens. But it is also a creative and suspenseful story that kept me in earbuds almost constantly for a few weeks! When I was in college, St. Patrick's Day was pretty much the biggest holiday of the year (with a big emphasis on green beer, of course), so it is still near and dear to my heart, even though I can no longer drink...or stay up late! I am wearing green, though, plus a lovely green nail polish (Minty Sprint! ), and we had our big corned beef dinner last night when my college son was home, with plenty of leftovers for today. If you are looking for a really great corned beef recipe for today (or some other easy and tasty meal ideas), check out my Weekend Cooking post from yesterday. And now, it is snowing again here today...sigh...yet another day with school cancelled! On the positive side, I have planned a little writing retreat for myself this week and am headed to the beach for a couple of quiet days to myself at a friend's condo. I am very much looking forward to the writing time and plenty of reading time, too! I am still reading The Amazing Adventures of Kavalier and Clay by Michael Chabon, even though we had our book discussion on it last week. I am down to the last 50 pages or so (it's over 600 pages!). I was surprised to find that some people didn't like it because I love it more the more I read. These two characters and their story really pulled me in and grabbed me. I can't wait to find out what happens next but also don't want it to end! I am also still listening to Allegiant by Veronica Roth, the third and final book in the Divergent trilogy. I like this one better than I liked the first two because it is delving into why this post-apocalyptic world is the way it is, so I am finding the story much more interesting and thought-provoking, more along the lines of Hunger Games or the Unwind series. My husband, Ken, read The Drop by Michael Connelly this week and enjoyed it - he and I have always liked Connelly's novels. Now Ken is reading Unsouled, the third book in the teen/YA Unwind trilogy by Neal Schusterman, which he, our college son, and I all love. This dystopian series is absolutely chilling because it is based on elements of our own current society taken to an extreme. Jamie, 19, started a new Medieval fantasy series (his favorite kind of book), The Staff and the Sword by Patrick W. Carr. Last week, he read book one, A Cast of Stones, on his Kindle, and he is now reading book two, The Hero's Lot. He mentioned to me yesterday that getting sick the previous week (bronchitis) reminded him of how much he enjoys reading, so he's trying to read more, even while he's at school. That's my boy. 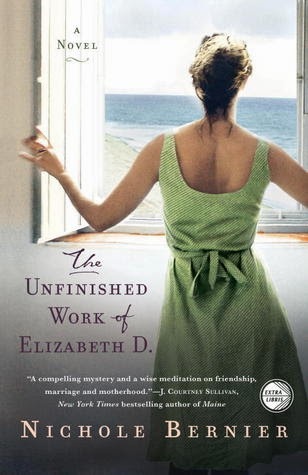 Review of The Unfinished Work of Elizabeth D. by Nichole Bernier, a wonderful novel. 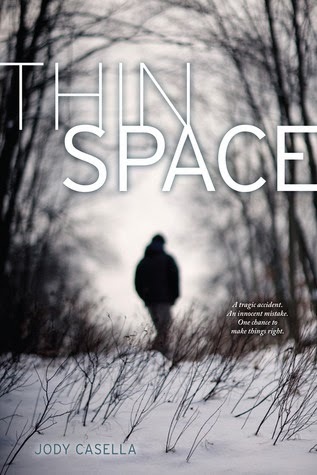 Review of Thin Space by Jody Casella, a teen/YA realistic novel with a supernatural twist. Summary of Books Read in February and Challenge Progress. 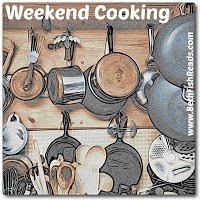 Weekend Cooking, including easy and tasty weeknight dinners plus my favorite Corned Beef recipe. We are continuing on our new eating adventures with a mostly Paleo diet, due to medical problems. Everyone felt pretty good this week, so I do think it's helping. My son felt very good this week (he's on a diet that even more restrictive than Paleo, until he maintains this level of improvement for a while), I felt good and had plenty of energy, and even my husband (who has no major health problems) has been feeling full of energy and in great spirits on this diet. Also, I lost 5 pounds which makes me very happy because one of the medications I started a few years ago made me gain 5 pounds, so at least I am back where I was before! I've had to start wearing belts again because my jeans keep slipping down! My husband has also lost about 5 pounds. Whether you are eating Paleo or not, we had some delicious dinners this week that are great for anyone who enjoys flavor! So far, I've just been using regular recipes (mostly from Cooking Light, as usual!) and making slight modifications for us, if necessary. I try to make traditional favorites when my college-aged son (the one with the worst medical problems and the most restrictive diet) comes home on Sundays - for him, that usually means beef! Last Sunday, I made him a classic roast beef (eye of round roast) and served it with pureed cauliflower and sauteed zucchini. Tonight, of course, we'll have our annual Corned Beef Dinner for St. Patty's Day, just with far fewer potatoes than usual! This is my favorite recipe for New England Boiled Dinner, though I will have to leave out the maple syrup today and go easy on the potatoes. There are plenty of other good veggies in this dish to make up for that. I've been trying to make sure we have fish at least once a week since it is so healthy and to prevent us from relying too much on red meat (we normally eat a lot of beans and other legumes which are out on this diet). So, one night, I made Pan-Seared Tilapia with Citrus Vinaigrette - it was sooo tasty! With it, we ate roasted asparagus (a household favorite) and delicious Bacon-Maple Brussels Sprouts. I just cooked two pieces of uncured, thick-cut bacon in a skillet, removed them and sauteed the halved Brussels sprouts in the bacon grease until cooked through, then glazed them with a tablespoon or so of real maple syrup, and finished them with a sprinkle of freshly ground salt and pepper and added the crumbled bacon back in. They were delicious and a great accompaniment to the fish. They were both just as good the next day for lunch! 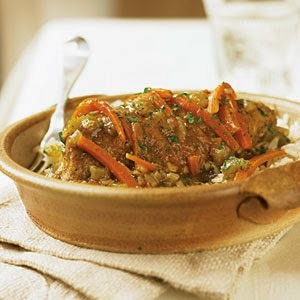 I tried a new crockpot recipe later in the week, Mediterranean Chicken, from the Cooking Light Slow Cooker Tonight! cookbook (sorry this particular recipe isn't available online). This dish was filled with flavor, and the three of us gobbled up all of it! It is basically chick thighs that have been browned on the stovetop, added to the crockpot with onion, tomatoes, seasonings, lemon, capers, and kalamata olives. I added some red bell pepper to up the veggie count. That combination of zesty flavors was fabulous. 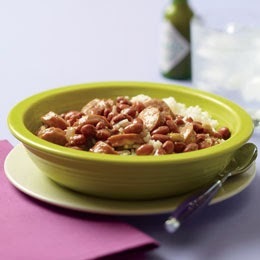 The only change I had to make was that the recipe recommended serving it over rice. We just ate it without the rice and I added some roasted baby bok choy on the side. Delicious! We will definitely make that one again. Friday night, my younger son begged for plain old spaghetti! He's been a good sport as the rest of us do this restricted diet (he has medical problems, too, but his are well-controlled with medication and he doesn't need any special diet). Since he was having a friend over, we went with classic spaghetti with meat sauce, with steamed green beans on the side. My husband and I did have a bit of the whole wheat spaghetti - since we don't have gluten issues, we've agreed to stick to Paleo most of the time but indulge in some whole grains or beans or corn once in a while. So, all in all, it was a very tasty week! 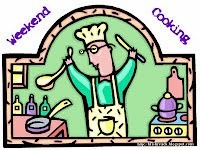 I hope you have enjoyed some good food and cooking this week as well! The snow is almost melted in our yard! My first afternoon spent on the deck. As the snow recedes, the first snowdrops are peeking out! These snowdrops are in bloom....more to come! Yet another snow storm...will this winter ever end? Can you believe it? I finished 9 books in February! To be fair, I started a couple of them in January - in fact, ironically, the time management book took me a full two months to finish (I guess I really don't have more time than I think!). 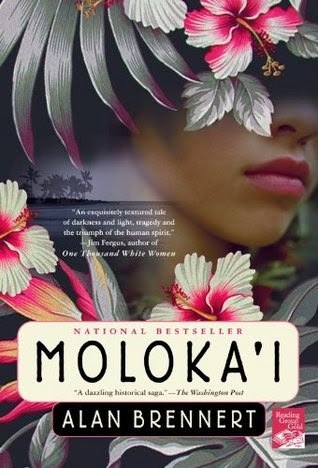 I liked every single book on this list, so it's hard to pick a favorite...I guess that would be a tie between Moloka'i and The Unfinished Life of Elizabeth D. - both were excellent, engaging novels. I read a nice mix - 4 adult novels, 1 nonfiction book, 2 teen/YA novels, 2 middle-grade novels, and three of the books were audios. I added six states to my Where Are You Reading Challenge 2014 (it's easy at the beginning of the year!). 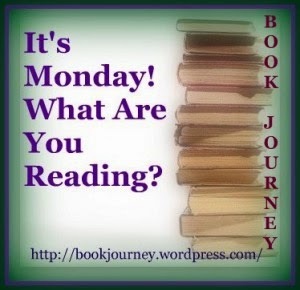 I read just one from my TBR shelves, Insurgent, for my 2014 TBR Pile Reading Challenge. At this rate, my TBR bookcase will burst! I need to stop going to the library for a while. I listened to three audio book for my 2014 Audio Book Challenge, so that one's going well so far. I finally read one nonfiction book! But no classics yet. What was your favorite book read in February? Busy Monday! I usually try to post my Monday update first thing in the morning, but here it is 4 pm already. I hope this isn't a harbinger of the coming week! I am still reading The Amazing Adventures of Kavalier and Clay by Michael Chabon - it is over 600 pages! - for my book group this week. There is no way I will finish it in time since I am still not even halfway through it, but I am really enjoying it. I've heard great things about this novel for years, so I'm glad to finally have a chance to read it. I am now listening to the audio book Allegiant by Veronica Roth, having just finished book 2 in the series a week ago. This is good preparation for the Divergent movie that is being released this week! And, I've inspired my husband to re-listen to the entire series (he's heard book 1 and just the beginning of book 2). My husband, Ken, finished John Grisham's latest, Sycamore Row, a follow-up to his famous A Time to Kill and a Christmas gift from our son. He enjoyed it, and I've moved it into my own TBR pile now! Jamie, 19, did some comfort reading this week because he got a bad cold and bronchitis and spent most of the week in his dorm room, resting. For him, comfort reading means re-reading old favorites. He re-read The Warrior Heir by Cinda Williams Chima, and now he is re-reading Merlin by Stephen R. Lawhead. 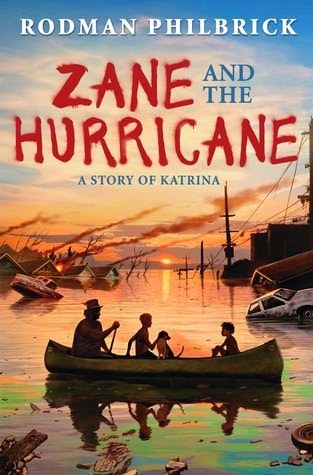 Review of Zane and the Hurricane: A Story of Katrina by Rodman Philbrick, an outstanding and emotionally powerful middle-grade novel. 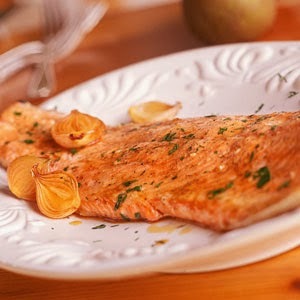 Weekend Cooking 3/9, with several dinner recipes appropriate for either Paleo dieters or anyone else. 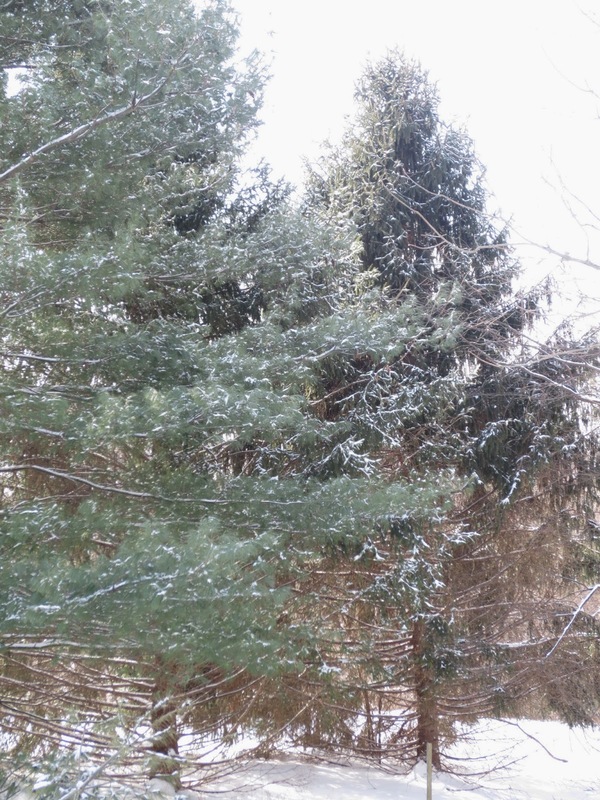 Snow still lingers in our yard, as the sunnier areas melt. Still plenty of snow in the back! Then, we got another big snowstorm this past Monday and were back to where we started from. It is supposed to go up above 50 today, which sounds like a miracle! Maybe some of this snow will melt again and this never-ending winter will finally come to a close. Hopefully, this will be the last of the snow photos for this year! Hope you are having a wonderful - and warm - weekend! I finished The Unfinished Work of Elizabeth D. by Nichole Bernier in time for my neighborhood book group on Wednesday. It was an excellent novel, and we had so much to discuss! In addition, the author very kindly made some personalized videos for our group, answering our questions about the book and telling us what was behind its writing. I hope to write a review this week and tell you more. My next book group book wasn't in at the library yet, so I squeezed in a short middle-grade novel, Zane and the Hurricane by Rodman Philbrick. It's about a young boy who is visiting his great-grandmother in New Orleans when Hurricane Katrina hits and how he survives both the storm and its aftermath. It's an emotionally powerful story that made me want to read more about Katrina. The timing was just right for me, as we used to live in New Orleans and were celebrating Mardi Gras this weekend. I hope to post a review tomorrow, Mardi Gras day. On Friday, I finally started my next book group pick, The Amazing Adventures of Kavalier and Clay by Michael Chabon. I've been meaning to read this award-winning novel for years, so I was glad when my other book group picked it; however, it's over 600 pages of very dense text, so it will be a challenge to finish it in time for next week's meeting! I finally finished 168 Hours: You Have More Time Than You Think by Laura Vanderkam! Woo Hoo!! It took me 2 months to read it, so I think I really needed it. The author had some interesting insights into time management, achieving your goals, and living a more deliberate life. I want to take some notes and try implementing some of her advice before I return it to the library. And I finished my audio book, Insurgent by Veronica Roth. I started it with my family last summer, but they lost interest, so I am glad that I finally found time to finish it. I'm not quite as big a fan of the series as some people are (for me, it's certainly not as thought-provoking or well-written as The Hunger Games trilogy, which I often hear it compared to), but it is an engaging story, and the audio was well done. I enjoyed it and am looking forward to the third and final book, Allegiant. My husband, Ken, is still reading John Grisham's latest, Sycamore Row, a follow-up to his famous A Time to Kill and a Christmas gift from our son. He was laughing last night at all the books I finished last week, but this is a hefty one he's working on. Jamie, 19, finished reading The Dream Thieves by Maggie Stiefvater and brought it back home so I can read it next. I'm not sure what he's reading now - with all the activity this weekend, I forgot to ask him! Weekend Cooking post, all about how to celebrate Mardi Gras - there's still time - 2 more days to go!